Once upon a time there was a good…a REALLY good father. He was the best kind of daddy. He made time for his kids. He loved to play with them and listen to them giggle. He loved to snuggle up close to them and told the very best bedtime stories followed by soft whisker rubs and many “I love you’s”. His love was so deep and wide that there was nothing that they could do to change the way he felt about them. He was a dad who knew how to balance his nurture and compassion with boundary setting to keep them safe and secure. His kids looked up to him and trusted him. One day, the kids went off to explore their yard. While looking in the far corner…by the tree that their dad told them not to touch or eat from because it would be harmful…they discovered something new. This something…this someone caught their attention because there was something in his voice that attracted their curiosity. This someone directed their attention back to the tree and for the first time they noticed that it had fruit. He told them that it was the most delicious thing that they would ever taste and wondered aloud why their dad would deprive them of it. He told them that the tree was magical and would make them smart, brave, and powerful. He told them that their dad didn’t want them to have all of these special gifts because then they wouldn’t need him anymore. The children pondered this deeply and as they considered this, their own understanding began to change. Truth became cloudy and then disappeared altogether. A new understanding of their relationship grew. Their dad was afraid. Their dad was insecure. He could not be trusted. The kids were uncertain but this someone seemed to know so much. What if their dad was holding out on them? How unfair he was being! They would show him. They would eat the fruit from the tree. And so they did. One after the other. They took their first bite and it was sweet. And sticky. And in eating it…they did change. Their eyes were opened. They looked around and discovered feelings they never knew. They felt vulnerable. They felt guilt. They felt fear. And so they discovered a new game. Hide and seek. They scampered behind the bushes because they knew that soon their father would come and call out to them to play or walk together and talk. Soon they heard his voice. They began to shake because they knew that they had disobeyed and disappointed him. They cowered in the dark corners, in the dirt, naked and afraid. All the while, their father called their names inviting them to come out into the light and into his arms. 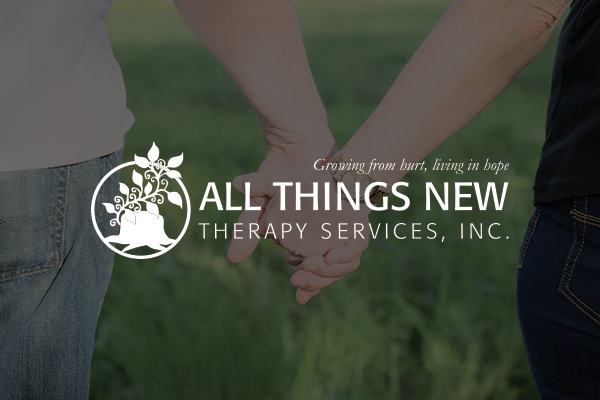 All Things New Therapy Services, Inc. recognizes this story in all of us. We come from brokenness…both inside and around us. Nothing remains untouched by this choice. Our genes, our body composition, and our neurological wiring are all wired in the direction of death. We are born to human families who share this ancestry. We bounce around feeling all of the feelings. Some feelings are remnants of our time with our Dad. These are the times that we reflect goodness…but such a very dim reflection of love, patience, and joy. Then there are the other times…too often…when we remember and live as people in the dark. We feel small, alone, and unloveable. We hide. We fight. We numb our insides from all that is raw. When we come out of our hiding places and into the light, His compassion is waiting for us. We will be made new and into His likeness.